Summary: This article is the first in a periodic series describing a software program developed to simplify the calculation and graphing required by the American Society for Testing Materials (ASTM) standard test method for particle size distribution of granular activated carbon (GAC). GAC particle sizing information is important for design and operation of liquid-phase GAC process systems. Having standardized test methods for the physical, chemical and performance characterizations of activated carbon materials is important. The ASTM committee D-28 is a voluntary group which establishes, approves, and publishes test methods that are useful for making buying decisions. Most purchasing decisions have ASTM test methods as a part of their specifications. Activated carbon manufacturers list ASTM test methods results on their product labels. The organization has a published test method for particle sizing of GAC, the activated carbon form most used in water conditioning and purification. Other forms of activated carbon such as powder, pellet, block and cloth are used less frequently in water purification. 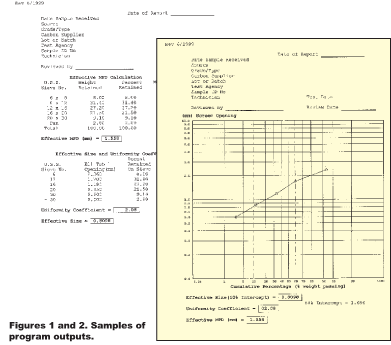 The test method (D 2862) for GAC particle size distribution determination requires data calculations and graphing on log probability paper.1 Personal computers allow easy-to-operate menu driven programs to be developed, increasing staff productivity, among other benefits. 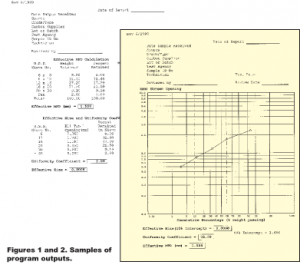 This software program is designed to be compliant with the ASTM particle sizing method—it only replaces the manual data interpretation with a computerized method. The computerized data interpretation is faster and more accurate. Using the program 2-to-3 times typically pays for the cost of the program in labor cost savings. Obtaining a representative activated carbon sample for laboratory testing is always of concern since this is a heterogeneous material, meaning it’s made up of dissimilar elements. GAC has a range of particle sizes, so a riffling or quartering of the laboratory sample assures that a representative sample is tested at the laboratory. The GAC particle sizing method consists of applying a known weight of GAC on the top sieve of a stacked set of five U.S. standard sieves and shaken under standard conditions for a specific time period. The weight percent of the total retained on each sieve and bottom pan is determined. Our personal experience has taught us to charge the top sieve with 100 grams. This simplifies the percentage calculations, and this amount doesn’t blind the screens. If particles lodge in the screen openings this “blinds” other GAC particles from passing through those filled openings. A mechanical sieve shaker used with the particle analysis has a side-to-side, up-and-down motion that minimizes binding. If 100 grams is charged to the top screen, the recovered weights from the individual screens and pan must not deviate more than two grams, in order to be compliant with ASTM. A larger deviation in the recovered weight requires repeating the method. Duplicate GAC samples are run to determine operator and/or interlabo-ratory repeatability, maximum deviations are defined by the ASTM method. With acceptable weight data the mean particle diameter (MPD), effective size and uniformity coefficient (see Table 1 for definitions) are automatically determined using this program. An example of the two-page output from this program is shown in Figure 1 and Figure 2, including: 1) example of effective MPD calculation using 8-x-30 mesh material, and 2) the cumulative particle size distribution curve. To get these two outputs the operator only needs to enter the weights on the individual screens from the laboratory data. The computer software has been programmed to make all calculations and present the information as shown here. This computer program is menu driven, with instructions for the operator at the bottom of each screen. It has been designed to allow the novice or busy staff to obtain accurate results in the least amount of time. Also, it provides archival outputs of the data in the standardized format that ASTM recommends. The information needed is highlighted with small rectangular boxes on the two-page output. GAC particle sizing has key significance and use in the activated carbon industry. It’s necessary to know the distribution of particle sizes of granular activated carbon in order to provide proper contact of gases or liquid in a packed bed of the materials. Changes in particle size distribution can affect the pressure drop across the bed and the rate of adsorption in a bed of a given size. Mean particle diameter is a property of activated carbons that influences pressure drop. Effective size and uniformity coefficient are two properties of activated carbons often referred to in municipal water treatment applications where control of particle size is of interest. In GAC applications for water purification, pore diffusion is a major contributor to the overall diffusion rate. Selection of the particle size could be critical. The smaller the particle, the faster the diffusion and thus the shorter the mass transfer zone. This is illustrated in Figure 3. It’s obvious from this graph that in a single fixed bed, the column having the smaller diameter GAC particles would treat a greater volume of liquid if it had to be taken off stream at c/c0 = 20 percent. However, it should also be recognized that if the full scale GAC system is designed to remove only saturated GAC from the system by using beds in series or a pulse bed, the carbon dosage would be the same for either particle diameter. New employees and individuals new to this business can benefit by becoming acquainted with the terminology used in this field. Again, see the glossary in Table 1. Mean particle diameter—the weighted average particle size, in millimeters, of a granular adsorbent computed by multiplying the percent retained in a size fraction by the respective mean sieve openings, summing these values and dividing by 100. Breakpoint—the appearance in the effluent of a specified concentration of an adsorbate. Breakthrough—the first appearance in the effluent of an adsorbate of interest under specified conditions. Channeling—the greater flow of liquid through passages of lower resistance which can occur in fixed beds or columns of particles due to non-uniform packing, irregular sizes and shapes of the particles, gas pockets, wall effects and other causes. 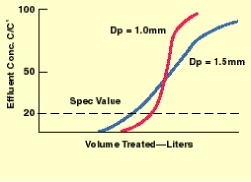 Critical bed depth—the minimum depth of an adsorbent bed required to contain the mass transfer zone. Crushing strength—the property of a particle to resist physical breakdown when contained and subjected to a slowly increasing continuously applied force. Dosage—the quantity of substance applied per unit weight or volume of the fluid being treated. Effective size—the particle size, in millimeters, which corresponds to 10 percent finer on the cumulative particle size distribution curve. Fixed bed—a bed of granular particles through which a fluid flows without causing substantial movement of the bed. Fluidized bed—a bed of granular particles in which the fluid flows upward at a rate sufficient to suspend the particles completely and randomly in a fluid phase. Granular activated carbon—activated carbon in particle sizes predominantly greater than 80 mesh. Impact strength—the property of a particle to resist physical breakdown when subjected to a rapidly increasing applied force. Mass transfer zone (adsorption wave, adsorption zone)—the region in which the concentration of the adsorbate of interest in the fluid decreases from influent concentration to lowest detectable concentration. Mean particle diameter—the weighted average particle size in millimeters of a granular adsorbent computed by multiplying the percent retained in a size fraction by the respective mean sieve openings, summing these values and dividing them by 100. Pores—the complex network of channels in the interior of a particle of a sorbent. Pore volume—volume of the pores in a unit weight of a sorbent. Riffling—technique used to assure the laboratory sized sample weight is representative of the larger received sample weight. All particles have the same opportunity to be a part of the test sample. Uniformity coefficient—The ratio of the particle diameter corresponding to 60 percent finer on the cumulative particle size distribution curve to the particle diameter corresponding to 10 percent finer on the same distribution curve. Additional related software program topics to be the subject of upcoming articles include: aqueous and vapor-phase carbon adsorption; volatile organic compounds (VOC) carbon adsorption with relative humidity; physical/chemical compound database; ASTM aqueous isotherm; and refractive index estimator software. If you know of software on any of the above or other activated carbon topics you would like to see included in this review, feel free to recommend them. We welcome comments about use of computer programs to increase productivity of water treatment systems using activated carbon. Electronic data management and commerce are critical success factors for future business. The authors would like to thank Dr. Milton Manes, Dr. Carl Yaws and Wayne Schuliger, P.E., for providing valuable information for the software programs developed by PACS. Richard Capp provides website maintenance for PACS at http://members.aol.com/hnpacs/pacs.htm. Information on this topic and other software programs can be seen on this website. ASTM Standard Methods D2862-92, Test Method for Particle Size Distribution of Granular Activated Carbon, West Conshohocken, Pa., 1999. Homer Yute, M.S., is a mathematics and computer programming expert with PACS Inc. He holds a master’s degree in chemistry from University of Pittsburgh and a bachelor’s degree from Geneva College in Pittsburgh. He has been developing valuable computer applications for PACS—which is an acronym for two firms: Professional Analytical & Consulting Services and Pittsburgh Activated Carbon Services, Inc.—for the last 10 years.